Cloves are much more than an aromatic ingredient to add zing to gingerbread and baked ham. This sweet yet pungent magnesium-rich spice can do a lot more for your cooking than that—and it has health benefits when consumed or used topically that have been known for thousands of years and supported by modern research. Once you get to know cloves a bit more, you’ll want to use and enjoy them in your kitchen (we’ll give you some great tips on that)…and maybe even bring some clove-containing products into your natural healing arsenal. Cloves are the dried flower buds of Syzygium aromaticum, a tropical evergreen tree native to the Maluku Islands of Indonesia—long called the Spice Islands because of their abundant clove, nutmeg and peppercorn production. (Clove trees are now grown primarily in Tanzania on the other side of the Indian Ocean.) All of these spices were luxury commodities, traded in Asia for silk, coffee and cotton, long before the Portuguese introduced them throughout Europe in the Middle Ages. When trading routes were expanded in the early 17th century, the Dutch seized control of the clove trade. As the spice’s availability grew, so did awareness of its benefits and uses. Besides their place in cooking, cloves became an ingredient in perfume, soaps and cosmetics—and a well-known health aid as well. One of the earliest recorded uses of cloves was as a breath freshener. Chinese people fortunate enough to appear before the Emperor would pop a few in their mouths to make sure their breath was pleasant. For centuries, cloves have been used to treat indigestion and nausea and ease tooth pain. 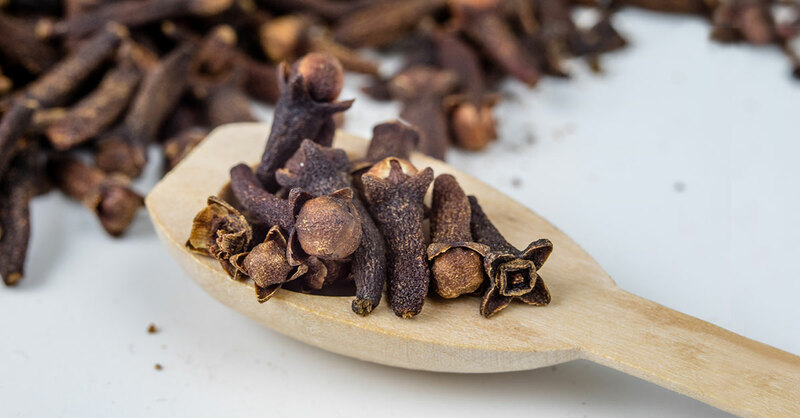 Despite this varied history, cloves have long played second fiddle to more heavily researched spices such as turmeric and ginger. But more recently, scientists have begun to study cloves for possible beneficial effects on cancer, diabetes, heart disease and neurological conditions. Combat inflammation: Chronic inflammation in your body can lead to diseases such as cancer, diabetes, depression and heart disease. Cloves contain not only eugenol but also flavonoids, other anti-inflammatory substances. Leo Galland, MD, director of the Foundation for Integrated Medicine in New York City, recommends including cloves in your diet twice a week as part of a comprehensive anti-inflammatory food plan. How to use them: Add three or four whole cloves to foods such as soups, stews and rice dishes while cooking as you would a bay leaf and remove them before serving (eating a whole clove would not be harmful but even cooked would be a bit intense). Try some ground cloves in your current recipes for breads, pies and spice mixes and rubs. (Go easy at first, as ground cloves go a long way.) Be sure to try the two flavorful spice mix recipes below in main and side dish recipes. Prevent gum disease: Gum (periodontal) disease is a very common inflammatory condition that stems from bacteria buildup that turns into plaque and then hardens into tartar on teeth at the gumline. The CDC estimates that half of all Americans have some form of it. In this case, it’s not cooking with cloves, but using products containing clove oil topically that can help you avoid this oral health problem. Toothpaste and mouthwash containing clove oil, widely available in health food stores and in some drugstores, can help prevent gum disease because the oil’s antimicrobial properties kill bacteria before it can do damage. If you already have the start of gum disease, its anti-inflammatory properties reduce gum inflammation. How to use it: Use toothpaste or mouthwash containing clove oil twice a day in place of regular products. Relieve pain naturally: Eugenol from cloves has anesthetic and analgesic properties and is commonly used in dental procedures to block pain. Outside of the dentist’s office, clove oil can numb the pain and reduce the inflammation of a toothache while you wait for a dentist appointment. It’s also an ingredient in some sore throat sprays. How to use it: Undiluted, clove oil is too strong and potentially irritating. If swallowed, it can cause abdominal pain, diarrhea and even (if you swallowed a fair amount) liver failure. To safely use clove oil for a toothache, dilute a half-teaspoon of the oil with an equal amount of olive oil, then saturate a cotton ball with the mixture. Apply the cotton to the painful pain area for one minute and then rinse your mouth. You can repeat this every four hours as needed, said Dr. Galland. Chewing on a whole clove can help with pain relief in a pinch if you don’t have any clove oil available. Reduce nausea, indigestion, bloating and flatulence: Feeling a little uncomfortable after a meal? Cloves have been used for centuries to relieve a variety of gastrointestinal issues, and research now shows why. The eugenol in cloves stimulates the production of mucus, which helps protect the gut against harmful bacteria. How to use them: Steep a few cloves in hot water and sip as tea, or chew on a dried clove until the discomfort passes. Extra tip: Using the spice more often in your cooking could help prevent tummy troubles. Safety warnings: Don’t use undiluted clove oil directly on your skin or inside your mouth because it can be irritating. Always dilute it because the concentration levels of medicinal clove oil can be very high. Never swallow or ingest it because it can be toxic. (Swallowing trace amounts if you use it topically in your mouth will not be harmful.) If you have liver or kidney disease or aspirin sensitivity, check with your doctor before using this or any medicinal herbs or spices. If you take a statin drug, check with your doctor before consuming cloves (other than as flavoring in food)—they could alter the way the drug is metabolized. Also, because eugenol can lower blood sugar and interfere with blood clotting, consult your doctor if you are taking medications that affect blood sugar or increase risk for bleeding. Storage advice: Because all spices lose flavor and potency over time, and ground ones faster than whole, for best flavor and the most healthful effect, buy small amounts of whole dried cloves and use them as is or grind them into a powder in a coffee bean grinder right before adding them to recipes. Test a batch of cloves for quality by pinching one to see if it emits aromatic oil. Store your whole cloves in a sealed glass container in a cool, dark, dry place, and they should stay fresh for about a year. Here are two different spice blends that highlight the pungent sweetness of cloves and other aromatics. 5-Spice Powder is a mainstay seasoning in Asian cuisines. Quatre Épices, or Four Spices, is a French classic used in meat dishes—despite its name, many versions have five or even six ingredients. These blends are for small batches. They will stay fresh—and potent—for two to three years in an airtight jar in a dark cabinet (the optimal environment for all herbs and spices). Put all ingredients in a spice or coffee grinder or blender and process into a fine powder. Note: You can adjust proportions to make it sweeter (more cloves and cinnamon) or hotter (more peppercorns). Put all ingredients in a spice or coffee grinder or blender and grind into a fine powder.